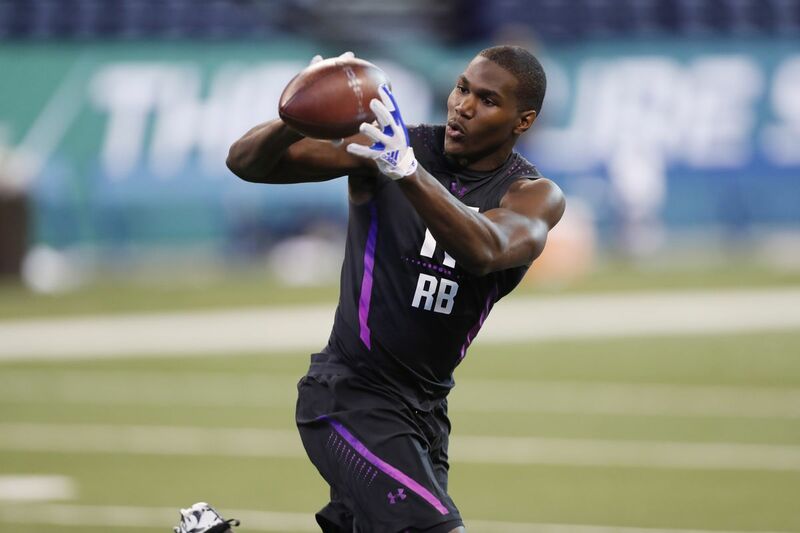 Meet Kerryon Johnson, an American football player and Detroit Lions number 43 pick in the second round of the 2018 NFL Draft. He had his college career at Auburn University and would be manning the running back position for the Lions. He was born on June 30, 1997, in Huntsville, Alabama. Johnson attended Madison Academy in Madison, Alabama where he started on his NFL launching career. He was a standout in his high school team which he led to three state championship games in three seasons totalling 5,274 career yards and 109 touchdowns (TDs). Also, he played multiple positions as a playing cornerback, kick returner, punt returner, quarterback, receiver and safety. He won the 2015 Alabama’s Mr Football award following a successful senior season wherein he had 1,659 rushing yards, 25 TDs and led his team to their third straight state title contributing to their 25 straight games win and back-to-back Class 3A titles. During the championship game, he set a state record with six TDs. Among his many titles earned during his high school career, Johnson won the John Stallworth athlete of the year award, Gatorade state player of the year, the MVP of Alabama-Mississippi All-Star Game, and USA Today All-American in 2014. Interestingly, the gridiron wasn’t the only sports he excelled in. He was also a phenom in basketball where he plays with fast feet and was named an All-State basketball player. He was No. 2 on AL.com’s 2015 A-List of the best senior football prospects in the state as well as ranked the No. 1 prospect in Alabama by 247 Sports, Scout and ESPN. With such a high profile, many varsities came calling for the talented player among which are Auburn, Florida State, and Alabama. Eventually, Auburn trumped over the others with Johnson committing to play for the Tigers which he joined in 2015. As a freshman, he played in 13 games starting once, recorded 208 rushing yards on 52 carries with three touchdowns. In 2016, he started six of 12 games played as a tailback and kick returner, rushed for 895 yards on 182 carries and had 11 touchdowns. He started all of the 12 games he played in his junior season with 1,391 yards, leading the SEC in rushing yards and 18 touchdowns (ranked second) on 285 carries averaging 4.9 yards carry. Additionally, he had 24 receptions for 194 yards and 2 TDS. His career kick return average of 25.12 yards ranks seventh-best at Auburn. He helped the Tigers reach the 2016 SEC Championship game, was a First-team All-SEC selection and won the SEC offensive player of the year both in 2017. Kerryon Johnson had to forgo his senior year following an explosive junior season to enter the 2018 NFL Draft. He was subsequently drafted by the Detroit Lions in the second round as the sixth running back taken in the draft. He would complement the veteran LeGarrette Blount who was signed by the Lions as a free agent in March 2018, as well as running backs Theo Riddick and Ameer Abdullah. Though he is yet to debut as a pro, he has already set sails to a great career in the NFL judging by his impressive performances in the training camp where he has proven to be an invaluable three-down player for any team that appreciates versatility and productivity. Johnson does it all; he can run the ball, catch the ball as well as block it. The Johnson family is one that is deep-rooted in sports with both parents, Kelly and Natalie leading the pack. Kerryon was born the last of four children including brother, Kerron and sisters Kolanda and Nyla. While their father played basketball, coaches the same and owns an athletic training facility in Huntsville, Alabama where he works with athletes in every sport from children to pros, their mother also played hoops at Chipola Community College in Marianna, Florida. Progenitors of standout athletes, you would agree. Coming down to the children, their oldest, Kolanda was an accomplished dancer and is a published author. The older son plays professional basketball in Europe and was named the Alabama Sports Writers Association’s “Mr. Basketball’ in 2009. He has also played in Germany and Italy. Nyla studied at Faulkner University where she played basketball an is a graduate assistant women’s basketball coach at Alabama A&M. Other than the family being addicted to sports, they are super close and supportive too. The parents’ build their schedule practically around their children’s activities and as such rarely miss their games and are always on hand to lend their support. The Lions running back could be best described as a little back with an unorthodox style of play being that he looks more like a receiver in his physique. He stands at 1.83 m tall (6 feet) bearing his slim 213 pounds (97 kg) body. Added to his receiver’s physique are his long arms (32.5”) which he uses to dump angle tackles, hands measuring 9.75” and a high cut waist. He is tough and instinctive as well as possesses the abilities, football skills and IQ needed to make a star athlete. His pass-catching skills out of the backfield and ability to run between the tackles create added value.